This blog is a little late in coming, for which I apologise. The truth is that I found the whole pre-order crescendo quite emotionally draining! The numbers of pre-orders were beyond my wildest expectations and blew my initial 'forecast' out of the water. Great news obviously and I am as grateful as I am surprised at the humbling support that I've had. When the excitement subsided I was left with a mountain of practical things to resolve, evaluate and decide on. Over one horizon to see the next! The first problem? How to fit all of the names in the book! That's a great problem to have I have to admit, resolved by a slightly increased text box size and a reduction in font size. Squeezing those names into the thank you pages! I'd put the cut off point at 10pm on Sunday evening for pre-orders to be thanked in the book. I had one or two stragglers (my own brother being one of them!) plus a couple of oversees orders from Australia and South Africa. So far I'm shipping to 13 different countries, which blows my mind! I'm really just missing shipping to the far East if anyone would like to oblige? Anyway, first thing Monday morning I added the last couple of names, proof read the whole document (for what seemed like the millionth time) and sent off to the printing house. Relief, you might think? Of course there was some relief, but I was becoming more and more concerned with being 'on press' and making sure that the end result would do the photographs and, more importantly, the support that I'd received, justice. Its at this point that I should put yet another good word in for Greg Stewart at Wells Printing and Kozu Books. I'm going to talk you through the litho printing process from my point of view, which is that of a total novice (so therefore my terminology is unlikely to be correct). So my concerns were real, based on what I believed where legitimate and demonstrable worries about making sure that the press results matched what I could see on my editing screen! Throughout the whole time Greg had complete (and as it turned out, justifiable) confidence in the litho press setup. That's not to say that my concerns were not valid or taken seriously, Greg dealt with everything with the patience of a saint! A man with faith dealing with a man with no faith! Any photographers who print their own work will recognise that there can be a certain amount of 'black art' involved in getting a print to match what you have on screen! Since there was no direct way to link and check my screen output to the output of the litho printer I would remain a sceptic. The crux of the problem is this, with litho printing, you can't really do a hard proof before being on press! 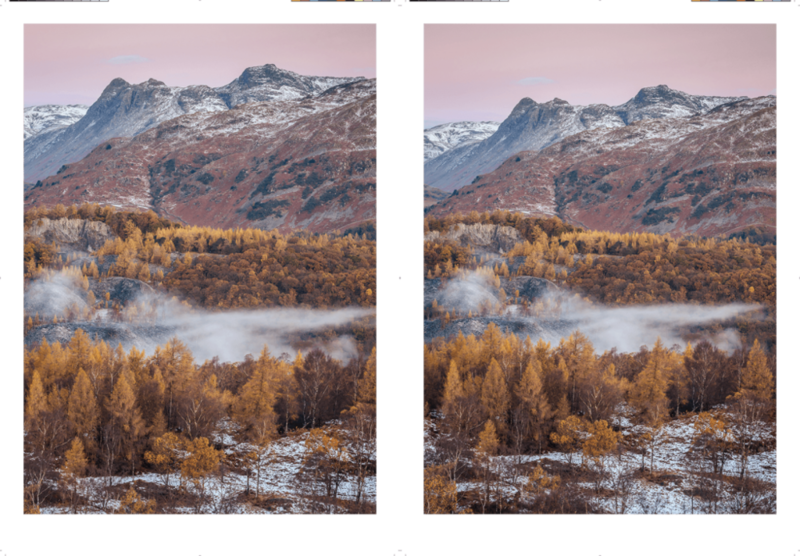 So you can never see a physical proof of an image, compare it to your editing setup and say "yes, that matches colour, tonality, contrast and saturation" (without the cost of such a proof being prohibitively expensive). As discussed in a previous blog, I have done several hard proofs of the book, but the printing process is different for those. The hard proofs were done using a digital system, HP Indigo, a fine piece of hardware but a totally different process to litho printing. The results were pretty good and I was happy for the most part with those, anything I wasn't happy about was down to needing to tweak my editing to be better for print. In the week leading up to being on press, Greg had sent some hard proofs of what I considered to be the most tricky images in the book. Images that I thought would look bad if they were even slightly off with the colour. They confirmed my worst fears! These proofs are not litho proofs, but proofs from a different setup altogether to 'simulate' the end result. They came with a proviso from Greg, "you may find the images slightly warmer than you were expecting, that is down to the paper which is not as white as the one you are using in the book" (for non-photographers, warmer just means more yellow / orange overall - like a warm day, as opposed to a more blue cold day). Despite the pre-emptive words from Greg explaining what I was seeing, my heart sank when I looked at them. Only a couple of days before spending up to 16 hours on press I was totally unsure that I was going to be happy with the results. So I went into 'you can only control the controllables' mode and decided that, despite my calibrated setup, I needed to view the final pdf on another calibrated system to make sure that what I was seeing when designing the book was a true representation. I needed to be 100% sure that what I was sending was correct. So I visited my friend Justin who is both a professional photographer and designer (handy eh!) and has a super impressive set up (his monitor alone cost more than my computer). That confirmed that the output from my system was true and therefore that's all that I can do before the big day on press. Hard proofs at the top, HP Indigo prints at the bottom. The proofs were a cause for concern. We had a very short time between closing the pre-orders and being on press. I sent the final pdf to Greg on bank holiday Monday. By Tuesday morning I was reviewing the final pdf proof that the printers had sent back to me to sign off on. Like me, you are probably asking yourself the question, so what is the difference between the pdf file sent by me, exported from InDesign, and the pdf sent back to me to approve? The truth is, hopefully nothing! In reality its one more step where everything is checked and double checked. A good job too! Greg's studio found an error in the pdf where a full bleed left hand page image extended onto the bleed of the right hand page. A schoolboy error I'm sure in terms of print design, but since I learned to use InDesign specifically to create the book I don't think it was so bad that this was the only error. With everything approved, we set off to spend the night in Bath so that I could be at the printers for a 6:30AM start the next day. Tom, my eldest, did the driving and we enjoyed an evening meal in the city before getting an early night. The Heidelberg Speedmaster press, with the daylight proofing setup to the left. 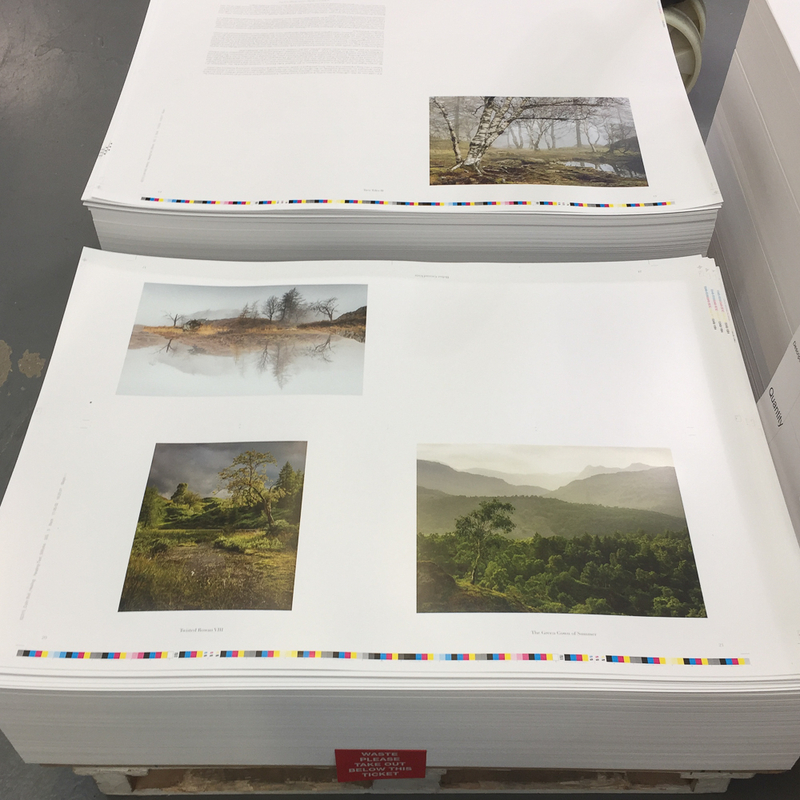 The way litho printing works is that there are four colour units, each has to be set up with an aluminium photographic plate that identifies the areas of each colour. The set up takes 10-15 minutes, inserting the aluminium plates and then running off a certain number of prints until the fully computerised systems indicates that the machine is up to speed and the colour is accurate. A printed sheet is then pulled from the pile and analysed under daylight lighting and compared to the proof. Once approved a sticker is placed in the printed pile to indicate that everything underneath is considered waste and everything above that will be identical to the approved print. The print run begins again and since the machine can produce 18,000 prints per hour, it is not too long before each set is completed. The aluminium plates are removed and the process begins again. One of the aluminium photographic plates. We had very few problems with the printing from then on. Just one or two small marks, which were attributed to small scratches on the aluminium plates and easily rectified. Only one set of prints needed to be adjusted for colour on press and that was due to one particular page being very sensitive to a small change in the red output. Again, fairly easily resolved given the hi-tech, computerised nature of the press. An incredible piece of kit. There was a twist in the tail though. It had been a long day but we were coming to an end, the only thing remaining was for the free prints to be done. Paper was switched to a higher gsm version and the set of prints were commenced in the same way as the pages of the book were produced. Summonsed over to the approval area I could see straight away that there was a problem with the crop on the two vertical / portrait format images. I had spent so long proofing the book so many times over that I didn't really pay enough attention to the prints. As soon as I saw them I knew what I had done, and once again, seasoned InDesign folks will probably be laughing at my schoolboy error. When setting up the InDesign template for the prints I had not done the 'fitting' properly and so that resulted in a slightly different crop to the equivalent images that were in the book. It was too late to change it though and the print went ahead. I was 99.9% certain that nobody would notice the difference but I also knew straight away that a) it was my error and b) I would not be happy sending the prints out. Spot the difference. The incorrect print on the left, the correct one on the right. After a night's rest I let Greg know that we would have to do the prints again at my cost. Never mind though, in truth I was really happy with how the day went and I even had some spare time the next morning to go sight seeing with Tom to the Roman Baths and to Wells Cathedral (both highly recommended by the way). So what now? The practicalities of packaging 350+ books is not to be sniffed at. Cardboard packaging, paper, bubble wrap, cellophane sleeves for the prints, label printing, order printing, making sure the choices are ready so that when the palette of books arrives the despatch can be as smooth as possible; though I think it will take 3-4 days to get them all sent out! At the moment, everything is on plan for despatching before the end of May. As soon as I have a firm date for delivery I will let everyone know. It just remains for me to thank you once again for your support. If you have got this far and haven't ordered a book, you can do so on the links below!